This “Way Too Early Mock Draft” represents a continuation, picks 21-30 in the first round of the 2018 NFL Draft. If you are looking for the Top 10 selections, CPGM Juice handled those picks here with a video providing more insight into those selections. If you are looking for selections 11-20, CPGM Drew handled those picks here with a video to boot. Keep in mind these mock draft selections come post NCAAF National Championship and prior to NFL Free Agency. It’s DRAFT SEASON folks, sit back and enjoy. Buffalo Bills – DT Vita Vea Washington – The Buffalo Bills have back-to-back picks in the first round due to trading down in the 2017 draft and selecting Tre’Davious White. An astute move by the front office; the Bills ended up breaking their playoff drought, however the quarterback position still remains a glaring hole on the depth chart. 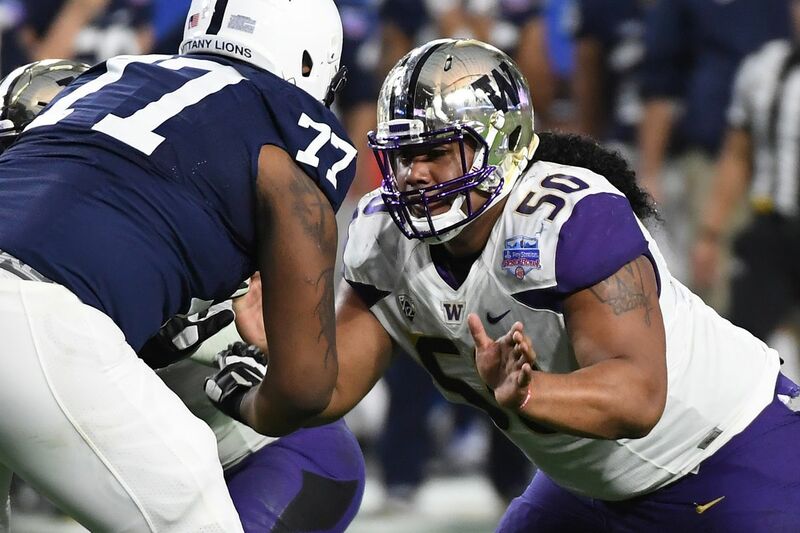 Head Coach Sean McDermott and company doesn’t seem like the type of organization to reach for a quarterback if all the big names are off the board, so why not improve their run defense with a big athletic body in Vita Vea? The Bills ranked 29th in rushing yards allowed and gave up the most rushing touchdowns during the 2017 NFL season. Vea is a force in the middle that can control the line of scrimmage and win at the point of attack. Buffalo Bills – LB Tremaine Edmunds Virigina Tech – The Bills will have defense on their minds with hopes of creating a similar front four like the one McDermott and Brandon Beane had in Carolina. 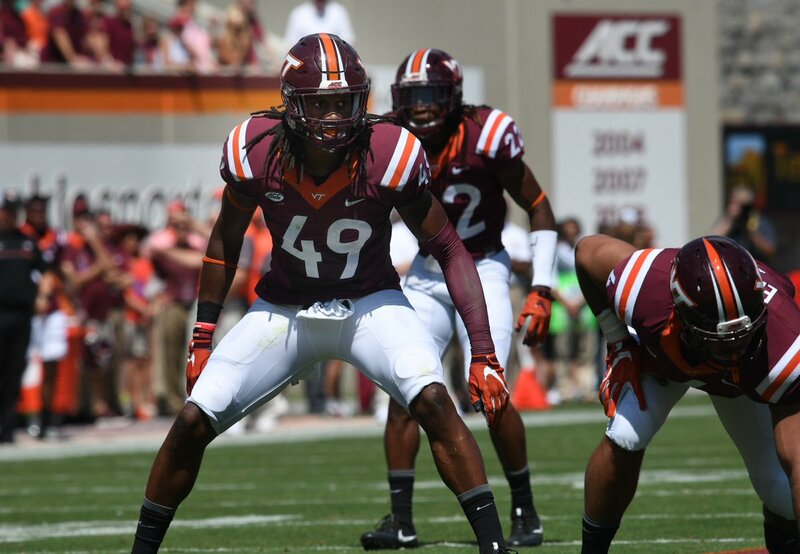 Tremaine Edmunds has been the talk of the draft as one of the most intriguing players because of his ability to get sideline-to-sideline and rush the quarterback. Edmunds is a big physical linebacker with rare athleticism and versatility that can be a main cog in the second level of the Bills defense. Panthers 2.0 will begin to take form in Buffalo. 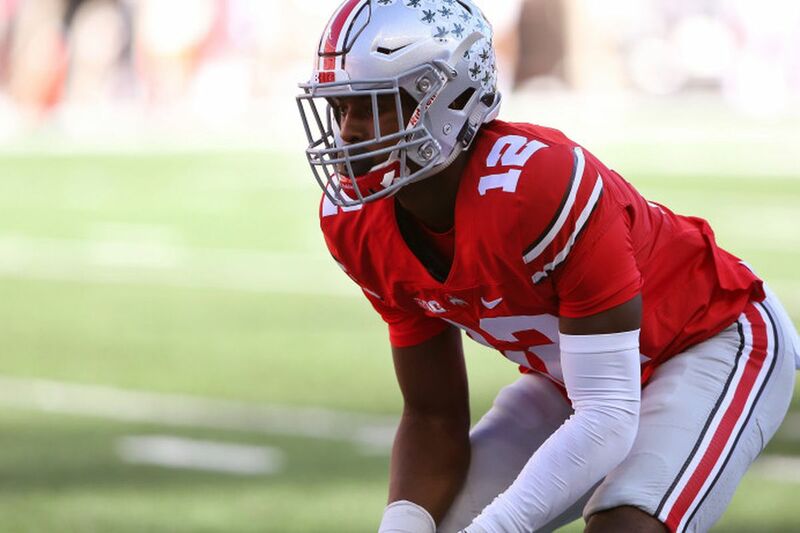 Los Angeles Rams – CB Denzel Ward Ohio State – Whether or not the Rams retain star corner Trumaine Johnson after tagging him for a second consecutive season in 2017, the team will more than likely select a cornerback in the upcoming draft. GM Les Snead should have a busy off-season with two of their best defenders hanging in the balance with Aaron Donald and Johnson looking to sign big contracts. The draft is where he absolutely has to win and it doesn’t get better than drafting one of the best corners in the draft Denzel Ward. The former Ohio State defensive back comes from a great pedigree of Buckeyes corners as Marshon Lattimore and Gareon Conley were both selected in the first round last season. Ward is not Lattimore but he might be a slightly better cover corner than Conley. He has the ability to mirror opposing wide receivers and cover man-to-man downfield which fits right in line with a Wade Phillips led defense. 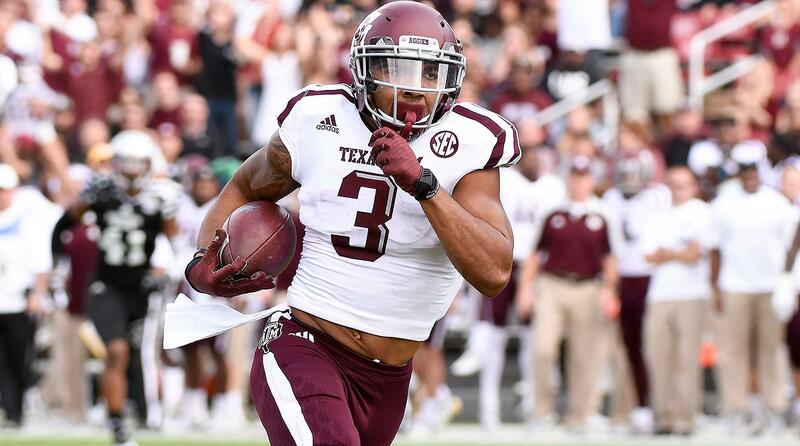 Carolina Panthers – WR Christian Kirk Texas A&M – If we learned anything from last year’s NFL Draft, we know the Panthers want to add speed on the offensive side of the ball. The team selected Christian McCaffrey and Curtis Samuel last season in order to make things easier for Cam Newton. The thought process was to get the ball out of Cam’s hands quickly to playmakers that can go the distance from anywhere on the field. It was a mixed bag of results as Samuel was loss for the season with injury and McCaffrey, although catching 80 passes, was not the big play threat the team imagined. The Panthers also traded previous number 1 receiver Kelvin Benjamin in the middle of the season to get more speed on the field. All of their recent transactions lead me to the dynamic Texas A&M receiver Christian Kirk. Kirk can line up inside or outside, catch it deep or catch a short pass and turn on the jets. He is lightning in a bottle that can help improve the 28th ranked passing offense. Tennessee Titans – EDGE Marcus Davenport Univ. of Texas at San Antonio – The Titans are in dire need of an infusion of younger talent coming off the edge of their defense. 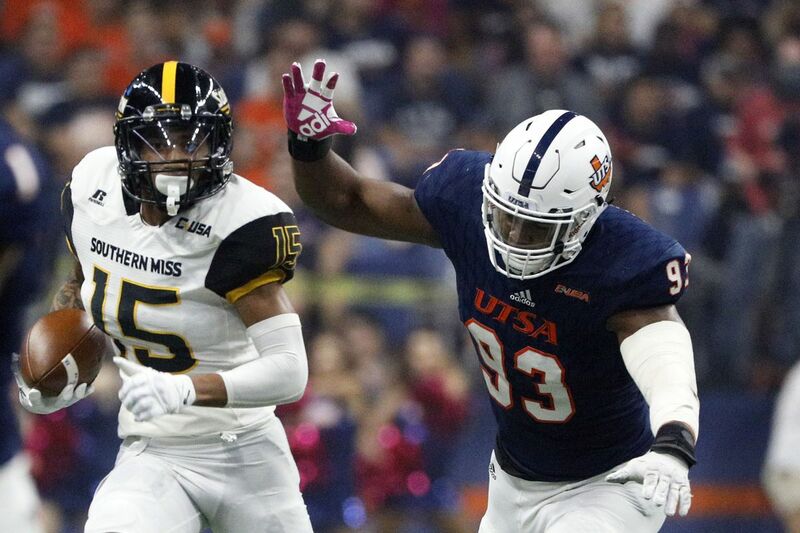 Brian Orapko and Derrick Morgan have had great careers and still can get it done despite getting longer in the tooth, but Marcus Davenport has the potential to take this defense to the next level. The small school standout is a long defender that can bend the edge and get to the quarterback quick, fast and in a hurry. The Titans secondary were susceptible in giving up huge passing games all season long and getting a guy that can get to the quarterback will help alleviate their secondary woes. I flirted with another edge rusher Arden Key in this spot but Davenport is the name flying up the draft board as he has enormous potential as 15+ sack guy. The twitchy athlete from the University of Texas-San Antonio has NFL size, the motor, pass rushing moves and can play the run just as well as getting to the quarterback. He just has to prove that he can win against NFL competition. Atlanta Falcons – DT Maurice Hurst Michigan – The Falcons have a decision to make on bringing back Dontari Poe after giving him a 1-year contract last season. After spending his first 5 seasons with the Chiefs as a run stuffer, Poe dropped some pounds and became a quicker interior lineman that created pressure on the quarterback. Regardless if the team chooses to bring him back or not, the Falcons will still need more depth along their defensive line. 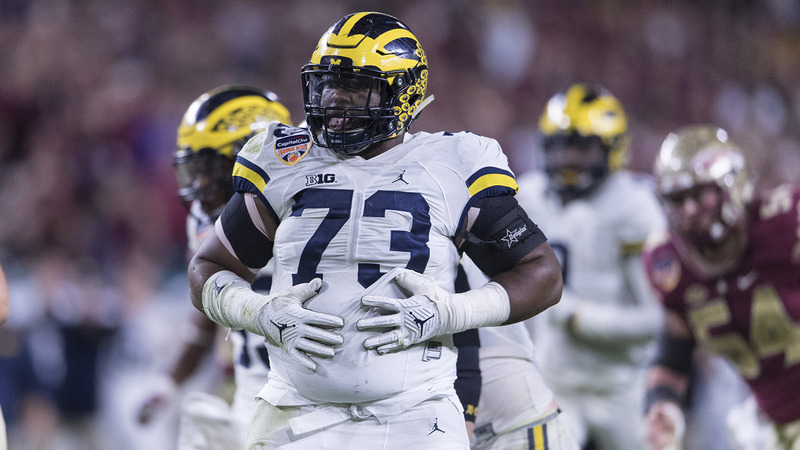 Enter Michigan’s penetrating pass rushing defensive tackle Maurice Hurst. The Falcons already possess young pass rushers in Vic Beasley, Grady Jarrett and Takk McKinley but Dan Quinn’s defense will not shy away from adding more speed along their front. Hurst’s nonstop motor, physical playing style and versatility will make him a valuable asset at the next level. 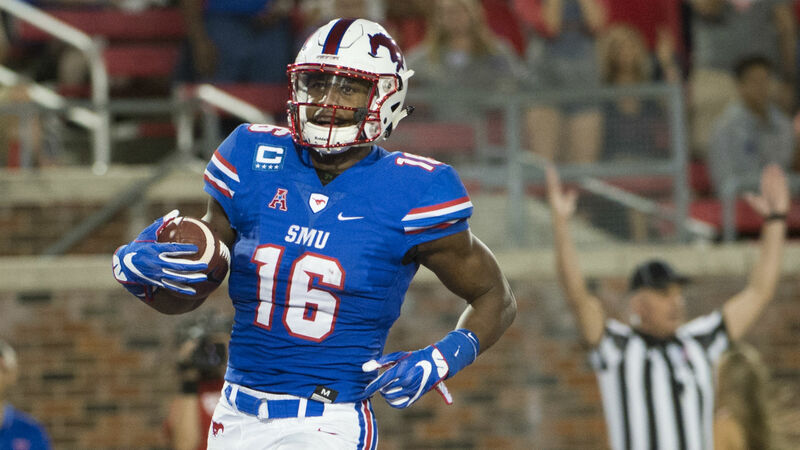 New Orleans Saints – WR Courtland Sutton Southern Methodist University – After hitting a homerun in last season’s draft with Marshon Lattimore, Ryan Ramczyk, Alvin Kamara and Marcus Williams, the Saints should continue to build through the draft. They could resume improving their much improved defense in the 1st round but I say go ahead and get a dynamic weapon for Drew Brees on the outside. The battery of Brandon Coleman and Willie Snead is due for an upgrade and the best receiver left on the board is Courtland Sutton. The duo of Michael Thomas and Sutton could be interesting in New Orleans as both possess similar traits as big body guys that know how to get open and catch the ball effectively. Pittsburgh Steelers – LB Rashaan Evans Alabama – The second level of the Steelers defense really got exposed in their playoff loss to the Jacksonville Jaguars. The defense just wasn’t the same without their leader in the middle Ryan Shazier. Shazier is progressing after his devastating spinal injury and back surgery. However, he is a long way from getting back on the field and his football future remains in doubt. 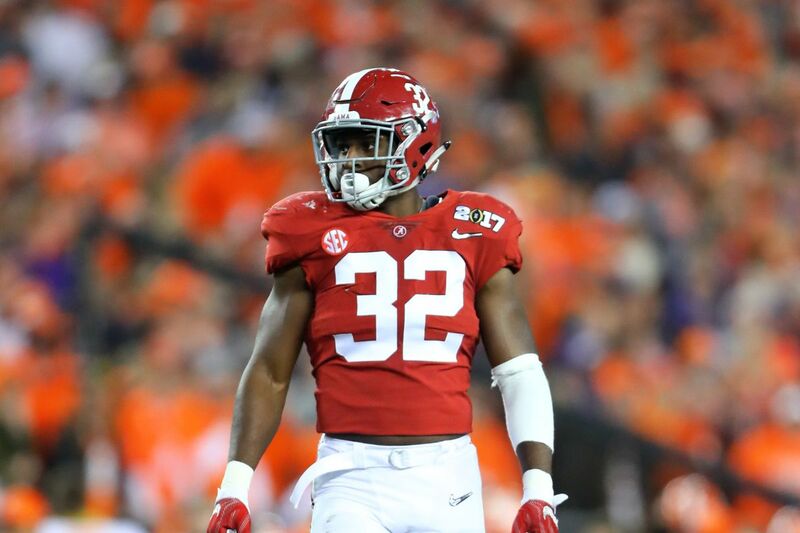 Rashaan Evans is an Alabama product that has been churning out solid linebackers yearly. An every down player that can help solidify the middle of your defense with his ability to play physical and fast. He is an instant plug and play starter that can become a leader for Pittsburgh. 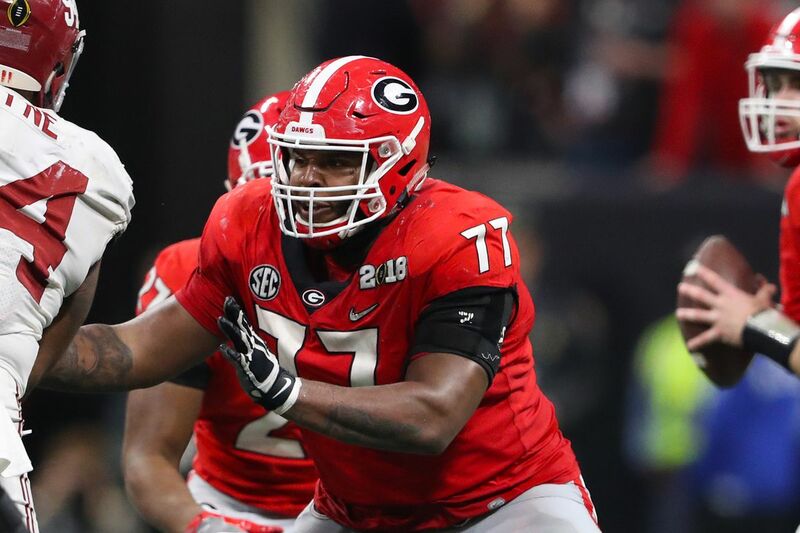 Jacksonville Jaguars – OG Isaiah Wynn Georgia – The Jaguars clearly have an identity as a team that wants to play lights out defensively and run the football. The offensive line is heading in the right direction after selecting Cam Robinson last season. But why not add more beef in the trenches with Georgia’s Isaiah Wynn? Wynn is a versatile lineman that played tackle and guard at Georgia. Due to his lack of length, he will more than likely get pushed inside at the next level. He can start immediately as he has experience at that position and spearheaded the Bulldogs rushing attack with Nick Chubb and Sony Michel. Wynn’s best quality is his ability to get a quick push in the run game with his excellent hand placement which equals more holes for Leonard Fournette to plow through. 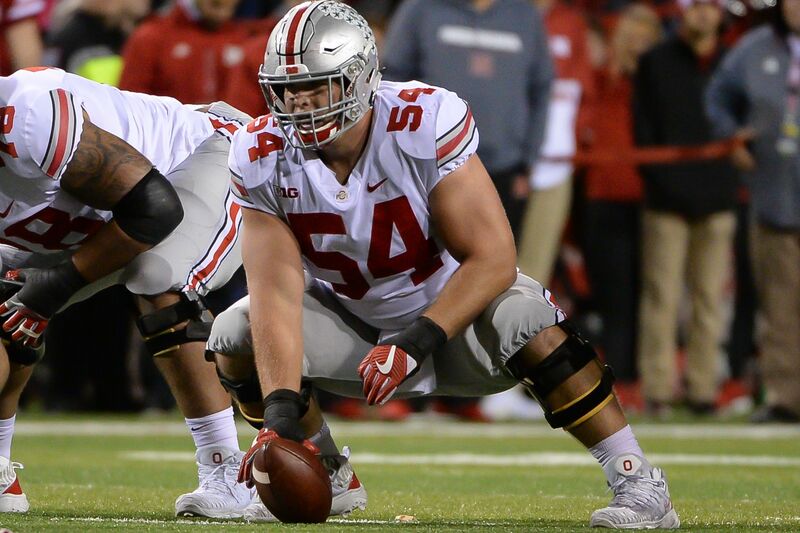 Minnesota Vikings – C/G Billy Price Ohio State – Although the Vikings defense struggled in the Conference Championship game against Nick Foles and the Eagles, the unit is one of the best in the league with little to no holes to fill. The team will focus on the offensive side of the football and what might be considered their worst positional group, the offensive line. The 2017 Vikings offensive line was much improved from what they threw out on the field in the 2016 season but the selection of Billy Price in the interior can make them even better. The Vikings selected Price’s Ohio State teammate Pat Elflein in last year’s draft and he turned out to be one of the anchors of the improved offensive line. Put him next to Price in the interior and this will make Dalvin Cook a happy man next season as the team should focus on running the football more.